Educating students for careers in transportation is vital to enhancing the quality of life for our state and the nation. 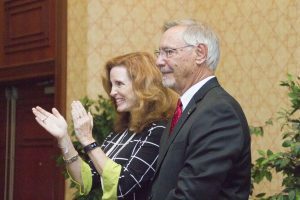 To assist in that education, and to help attract the best and brightest to careers in transportation, CUTR established the Georgia Brosch Memorial Transportation Scholarship, named in memory of the infant daughter of former CUTR Director Gary Brosch and his wife Barbara. Funding of the scholarship comes from individual and corporate donations as well as a portion of the proceeds from the CUTR Transportation Achievement Awards Dinner. Winners of the scholarship are announced in the Fall and are presented at the annual CUTR Transportation Achievement Award dinner. See past recipients of the scholarship. Scholarship competition is open to any current USF student with the intention to pursue a career in transportation, as evidenced by substantial coursework in transportation. Students must have completed at least one semester at USF. No student may receive the award more than once. Applications are now available for the 2018 year! If you would like to make a tax-free donation to the Georgia Brosch Memorial Transportation Scholarship fund, use the button below. For further information, please contact CUTR.